Craft beer fans in the area have been "teased" with the prospect of fresh cask beer at a couple of local pubs for some time now. Unfortunately, we've seen very few casks being served locally. In all fairness to the proprietors, the logistics required to prepare, properly store, and serve cask beer are complex. Wednesday evening I joined a friend for dinner at The Fredericksburg Pub. I made my usual query, "Anything on cask?" Imagine my surprise when the waitress replied "Yes, we just got something." She reached for her notes and said "Loose Cannon, Hop3." Wow! One of my favorite Clipper City beers, and on cask! The Clipper City Loose Cannon Hop3 Ale was served cellar temperature, with a sticky one-inch foamy head. 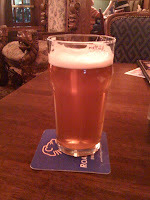 As soon as the beer reached the table I got a whiff of the citrus and floral hops. The taste was crisp and very citrusy. Despite the attractive head, the carbonation level in the beer was low, as it should be. I've had Loose Cannon on cask several times in the past, but this serving seemed exceptionally fine. I enjoyed the Loose Cannon with a Pub Burger, savoring the aroma of the beer as much as the flavor. I don't know how long it will be before this beer runs out, but I'm hoping to get back to the Fredericksburg Pub for more very soon.